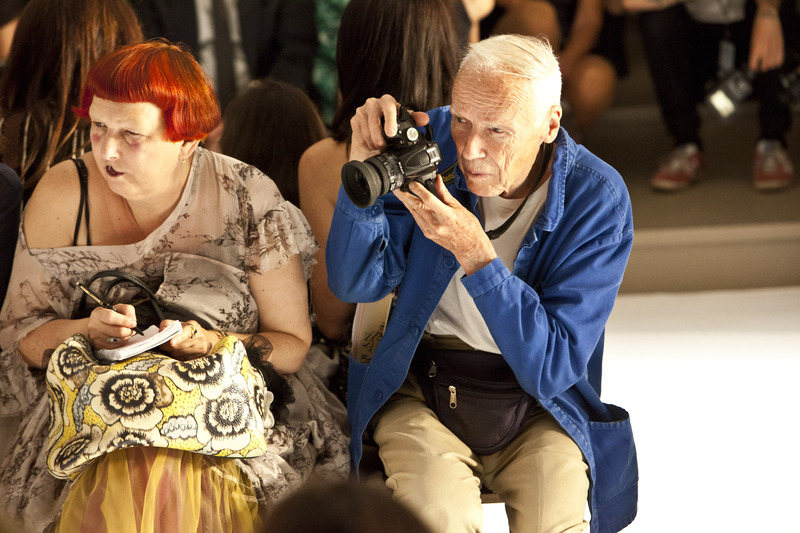 The fashion industry mourned an icon this weekend as the world learned the news that legendary fashion photographer Bill Cunningham passed away on Saturday, June 25. At age 87, he left behind an innumerable amount of photographs recording 50 years of evolving style in high fashion and on the streets of New York City. It's a legacy that is mostly unmatched and will be missed strongly by those who knew him and knew of him. Cunningham's influence not only stemmed to documenting the fashion industry, but to shaping how the world of style and the real world intersect both accidentally and intentionally. The artist worked for The New York Times for 40 years, and during that time, produced some of the most insightful work on street-style and public interpretation of fashion ever seen. His work was the opposite of pretentious, and only sought to represent the beauty in individual taste and self-expression. This, in and of itself, is reason enough for Cunningham to be remembered as a fashion icon. Although he wore the same blue jacket day in, day out, the photographer's imagery speaks for itself. But just in case you aren't familiar with his work or the importance of said work, here are the many reasons why Cunningham will be so sorely missed by the general public and the celebrity world in equal measure. Just to reiterate, Cunningham rocked the same blue jacket throughout most of his career. By doing this, he inadvertently gave himself an iconic look — much like Anna Wintour's bob or Karl Lagerfeld's white bouffant. In sticking to one style, Cunningham made his blue jacket legendary. Maybe that seems too harsh, but it feels true. Cunningham was here for the fashion, not the performance. He famously said, "I’m not interested in celebrities with their free dresses. Look at the clothes, the cut, the silhouette, the color. It’s the clothes. Not the celebrity and not the spectacle." Cunningham didn't care for the fame involved in the fashion industry, and especially didn't want it for himself. In The New York Times remembrance of Cunningham, reporter Jacob Bernstein wrote, "Mr. Cunningham told nearly anyone who asked about it that the attendant publicity was a total hassle, a reason for strangers to approach and bother him." Although street-style is huge in the blogosphere today, Cunningham was recording it well before the internet even existed. Spotting Cunningham wasn't just about recognizing his blue jacket, but the bike he rode through New York City to capture his famous photographs. Instead of taking up industry perks like chauffeured cars, the artist stayed true to himself and his method of transportation. Cunningham wasn't constantly trying to climb the ladder or change it up. He knew what he loved, he knew what he was doing, and he did it well. His consistency in finding amazing street-style and documenting it was part of why his popularity never ceased. "The wider world perceives fashion as frivolity that should be done away with. The point is that fashion is the armor to survive the reality of everyday life. I don’t think you can do away with it. It would be like doing away with civilization," he once said. This quote sums up my adoration of fashion more than any other in existence. This book, put together in collaboration with fellow photographer and friend Editta Sherman, shows the brilliance of Cunningham and his knowledge of fashion outside of street style. If you haven't heard of it, please look it up right now. It's a perfect chronicle of '70s New York. Although honored and adored by the fashion industry for decades, Cunningham never saw himself in such a way. He described himself humbly: “I’m a zero. I’m a worker in the factory. I’m like you and everybody else. I’m still enjoying what I do." His was not a case of "we all have to start somewhere." Instead, Cunningham was always all about fashion, whether it being making hats for Marilyn Monroe or photographing baseball cap-sporting teens on stoops. In fact, Cunningham barely saw what he did as work, but rather a labor of love. He once said, "It’s not work, it’s pleasure. That’s why I feel so guilty. Everybody else does work — I have too much fun." As a street-style photographer, this may seem obvious, but his adoration of clothing over celebrity is one that deserves to be praised repeatedly. "I could never concentrate on Sunday church services because I’d be concentrating on women’s hats," he commented. Although popularity shouldn't be seen as a factor in someone's worth or brilliance, Cunningham was rightly loved by the entire fashion industry. Even Anna Wintour once said, "We all dress for Bill." "If you don’t take money, they can’t tell you what to do, kid.” Not only did Cunningham continue to work until the very end, but he never lessened himself or gave up on what he was passionate about. Not even once. Last but not least, Cunningham was so adored because his work was so adored. He was a beautiful person, yes. But his photography was just as beautiful — mainly because he found the beauty in everyone's unique interpretation of fashion. Cunningham's legacy will not be forgotten because it was unique. He cared about fashion not just for fashion's sake, but because of the impact it can have on the world and on individuals. Although there will never be a photographer like Cunningham again, let us find comfort in the knowledge that we have such a vast catalogue of his work to look back on and enjoy.